When should I consider using industrial CT scanning vs. other scanning technologies for collecting 3D metrology and point cloud data? 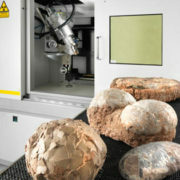 Do you have any other questions or comments about industrial CT scanning or its uses? Please let me know. Feel free to contact me or call our offices at (513) 771-7710. We have been fortunate enough to form a partnership with Nikon Metrology and use their latest CT scanning technology. These scanning machines use X-rays to penetrate an entire assembly at one time, eliminating the need line of sight restrictions you would have with laser, probe, vision or structured light scanning systems. Its non-destructive testing capabilities allow us to scan entire systems without disassembling critical components. We will break down the paradigm that precision industrial scanning is expensive and time-consuming. Our services will provide ISO 17025 certification quality combined with excellent turnaround for our services and 24/7 customer support.